Biryani, according to me, defines Indian food. It was originally brought into India by the Moguls in the form of Persian Pilaf. 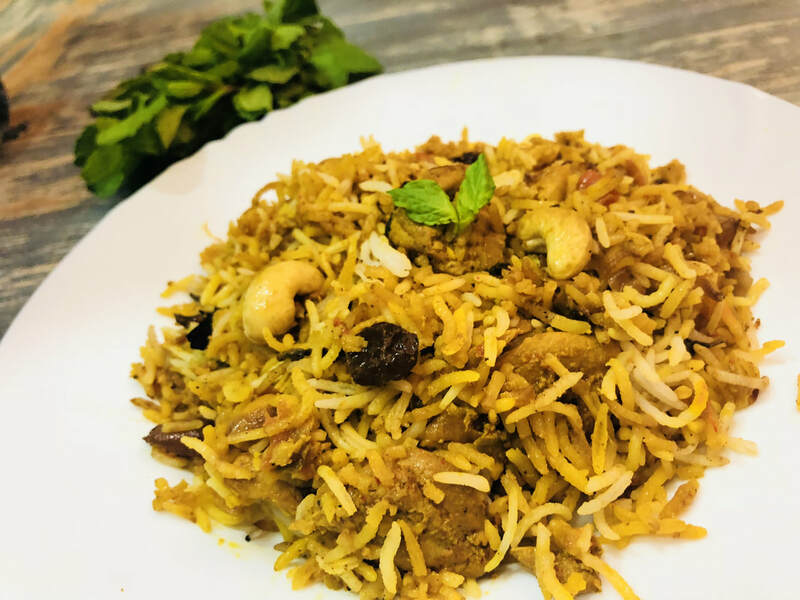 Over time the chefs of the Mogul empire fused it with Indian Pulav and it evolved into this luxurious blend of spiced meat, basmati rice, saffron, raisins and nuts. Enjoy the recipe! 1. Place cinnamon, cloves, bay leaves, cardamoms and garlic in a soup bag. Place soaked rice and water in a saucepan. Add freshly squeezed lemon juice, ghee and salt, stir. Throw in the soup bag and boil rice for about 10 minutes until almost cooked. Discard spices in the soup bag, drain rice in a colander and set aside. 2. Soak saffron strands in warm milk for at least 30 minutes. 3. Heat oil in an ovenproof saucepan, add cumin seeds and sliced onions. Fry on medium-high heat until onions turn crispy brown. Drain and set aside half of the onions on a kitchen towel to cool. 4. In the same saucepan, add chopped ginger, garlic and green chilies to browned onions. Stir-fry for about a minute, then add chopped tomatoes followed by coriander powder, chili powder, turmeric and salt. 5. Next add chicken tikka, and stir-fry for about 10 minutes until tomatoes are pulpy and the sauce is thick. 7. Spread basmati rice evenly on top of the chicken. 8. Pour half the milk and saffron evenly on the rice. 9. Sprinkle a teaspoon of garam masala, cashews, raisins, fried onions, coriander and mint leaves evenly over rice. Pour melted butter all over. 10. Make a few holes in rice and chicken mixture using the back of a knife for steam to escape. Cover with aluminium foil. 11. Cover saucepan with a lid and place it in the oven for 25 minutes. 12. Mix gently before serving. Serve hot garnished with quartered boiled eggs.